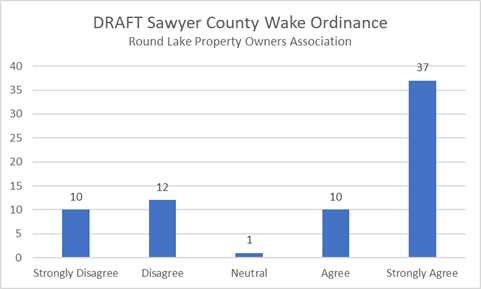 The Sawyer County Land, Water & Forest Resources Committee voted unanimously to approve and send to the full county Board the fourth version of a boat wake ordinance now titled, "Motorboat Wake Protection Area." The ordinance will receive a legal screening before enactment to answer the question, can a county regulate public waters. A public hearing was held prior to the vote. Approximately 30 people attended the hearing. Several people spoke in favor, several against, and two people provided comment without indicating their position. Sawyer County Lakes Forum, and Tiger Cat Property Owners Association, stated that they were in agreement with the ordinance. Courderay Owners Lake Association was against. There were two wake boat owners who also stated that they were against ordinance. RLPOA shared the results of our survey, but told them that the RLPOA was not taking a position on this ordinance. There was some confusion of whether this was a wake boat ordinance or a wake ordinance. It was verified that this ordinance pertained to any boat that generated a wake higher than 24 inches. After public discussion, the Land, Water, Forest and Resources Committee discussed the ordinance and ultimately voted unanimously to approve the ordinance. The next step is legal review. If it is determined that this is a lawful ordinance, then it will be forwarded to the Sawyer County Board for a vote. Once passed by the Sawyer County Board, it will become effective immediately. The version passed by the committee: Sawyer County Wake Ordinance-4.